Limited Time only - Free Upgrade to CROSS-DRILLED SLOTTED rotors. This is a brand new complete Mustang II front end suspension for your 1935 1936 1937 1938 1939 1940 Ford Car. This kit is a complete Hub to Hub kit and includes the highest quality components for a complete installation. The crossmember is designed specifically to weld onto your 35-40 Ford frame. This kit comes ready to install. Instructions are included on welding the tube/gusset to the crossmember and placement of the crossmember, but not full instructions on building your car. Professional installation is recommended on all brake and suspension parts. This is a complete kit and includes all of the following. Upper and Lower Black Coated Tubular A-Arms (with ball joints, bolts, gussets, and tubes included) - 5/8 Narrowed for correct wheel base. Manual rack and pinion steering. Forged Steel Caliper Brackets w/ Bolts. Calipers with Brake Pads and Pins. Bearings, Seals, and Dust Caps. 11" Vented Disc Brake Rotors--Ford Pattern (5x4 1/2"). Limited Time ONLY Free Upgrade to Slotted Rotors. Coil Springs with Spring Pads. Braided Stainless Brake Hose Kit. Again, this kit is complete from hub to hub kit. The Forged caliper brackets are the strongest on the market, they are not the flimsy cast brackets! This kit is a huge savings! 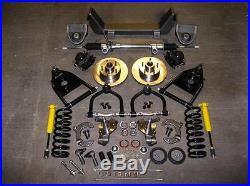 GH-34443-DLX Front End Kit (Manual, 2 Drop, Ford Pattern Slotted, SS Hoses, Narrow). Plus, we have access to thousands of parts that are not listed. We do get hundreds of emails daily, so at times it may take us up to 72 hours to respond to your emails. The item "1935 1940 Ford Car & Truck Mustang II Complete Front End Suspension IFS Hub" is in sale since Monday, September 14, 2015. This item is in the category "eBay Motors\Parts & Accessories\Vintage Car & Truck Parts\Suspension & Steering". The seller is "gearheadworld" and is located in Cedar Falls, Iowa. This item can be shipped to United States, Canada.